Our hero shows the spy a map and a projection image of a flower. Of course, 007 knows exactly what it is. 007: "Orchidia Negra. A very rare orchid indeed. Q: "Yes. It was thought to be extinct, until a miossionary brought one back from the upper reaches of the Amazonia." 007: " Well actually, he brought it back from the area of the River Tipperaqui." M: "Well done James. You'd better get up there. And fast." Q: "And I've got something to get him there - if 007 can be trusted to look after it." The next scene features Bond flying through the Amazon in a very speedy speed boat. Of the 300 of these beautiful speedboats that were produced, three were for Eon Studios for use in Moonraker. The Ian Fleming Foundation is said to still own one of the water borne vehicles. Inspired by the Aston Martin led impact that such 007 modes of transport convey, the Glastron features the usual rear bullet protection shield, mines, for the ejection of, Torpedoes, for the launch of, and a fancy roof that turns into a get-out-quick-we-are-about-to-plunge-off-Iguassu-Falls escape hang glider. 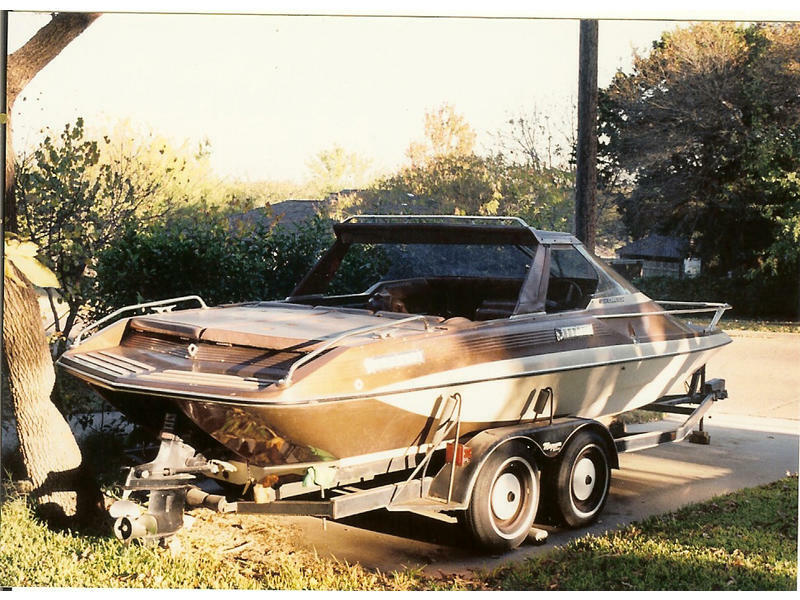 "1978 Glastron Carlson CV23HT with trailer, Same model used in James Bond movie, "Moonraker". Collector's item - only 300 made and only 4 or 5 remaining. Carpet and upholstery in good condition, no tears, fresh water use only." We do not know if it is still for sale.